First, congratulations to the US team for beating the Canadian team. We’ll get you back in the Olympics (seriously, that Canadian roster looks stacked with the top line from San Jose and with others). As with every year on the blog, I try to make an annual thing out of reviewing the resolutions from last year for myself personally, the game, and the blog. Let’s start with that. Did I meet the goals I set out to do last year? Resolution: 3000 subscribers – Thanks to your readership, I have exceeded that and have managed to entertain 5000 bored players at work or school. Resolution: 1.5 posts per day – Nope, not quite. My responsibilities have increased and I have not been able to fulfill that resolution. I’m working with a great crew that’s as diverse as it can get. With Lodur, Thespius and Mimetir, the blog provides a variety of insights. Still could use that elusive Holy Pally contributor. 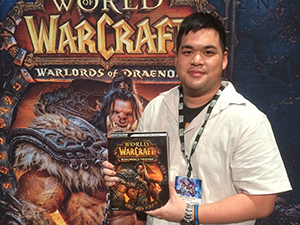 Resolution: Top 10 server – Nope, Ner’zhul is a ridiculously competitive server. We’re barely breaking into the top 20 overall. According to Guld Ox, we’re exactly 10th Alliance side. Resolution: Avoiding Burnout – Still here and I’m still not close to feeling any burnout. Thank goodness for cheap steam games in keeping me occupied. Resolution: Raid achievements – Managed to pull off some of them but not as many as I’d like. The focus continues to be on progression. We’ll look at some of the other stuff later on. Resolution: Let things go – Yep, I’ve learned to keep my distance on topics that I would have commented on in the past. Sometimes, it just isn’t worth it. Resolution: GPA to 2.5 – Nope, holding at around 2.2. I learned that distance education courses and myself just don’t agree with each other. I lack the discipline on my own. I need to actually be in a classroom where I can directly ask for clarification on stuff that just doesn’t make sense to me. Time to set some goals and tasks for this year. Resolution: 10000 subscribers – A bit ambitious and it will be double the current amount. It’s how I measure the progress of my blog. Page views have remained increased slightly (not in the same ratio). I’m more concerned about being read then I am with just page views. Resolution: Consistency with NSUI – It’s a great blog and a great idea. I just wish I had more time I could devote to it. I blog about different addons and ways to help players when I can. I’ll try to start with a consistent update time on a weekly basis. Resolution: 8000 achievement points – Slowly but surely, I am getting there. Resolution: Arthas hard mode (25) – That’s my ultimate goal. I’m not quite sure what to do at the moment. I feel rather lost. Undecided about Crim and Communications (or Journalism) is unavailable to me. Maybe I should just finish with a BA and get out of here and start working. Get the heck out of school would be a great resolution but I won’t be able to pull it off this year. 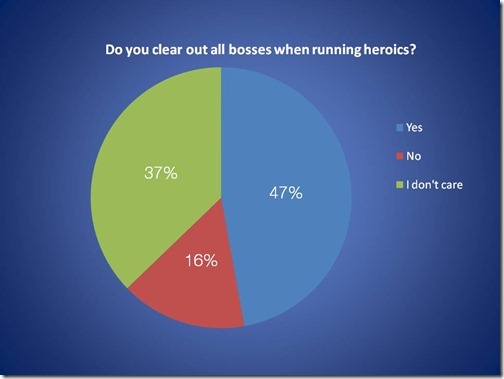 I resounding 47% of you do go after each and every boss in the instance. The next chunk of players are indifferent and go with the flow. A staunch 16% won’t knock out all bosses if they can get away with it. I suspect those might be the players where nothing attractive remains in current heroics or from Triumph badge vendors. I promised I’d write them and they’re on the way. Bear with me. If it takes me a few days, a few weeks, or a few months, I will get them finished. I stepped down from handling Spiritual Guidance to focus on more general work and Raid Rx on wow.com. The site is expanding. A healing priest and a shadow priest have been brought on for twice the priestiness. Yes, our class is so awesome, we get two columns featured. They’re also looking to expand again. A Resto Druid, a Holy Paladin, an addon specialist, and a lore specialist. More healers would indeed be awesome. Now they can heal me through the various PTR runs! Quick application tip: I’m just going to use an example on the blog here when I look over contributors who want to work with me. Don’t bite the hand that feeds. If you’re applying for a position, don’t talk trash about the employer and then apply to them expecting to be successful in your application. I’ve seen people trash my blog and the work I invest into it on their twitter or their blog and then they get in touch with me asking why I never link to them or highlight their work. Like, seriously? I didn’t realize there were people that dense that were out there. Blogs are google-able. Everything is accessible. Nothing is hidden. There is a line between constructive critique and being a dumb troll. Dumb trolls don’t get very far and they never will because they just don’t learn. So take chances and shoot more. You just might score one. If you’re unsure or have any questions, feel free to drop me a line. There are some questions I won’t be able to answer but I can try. It doesn’t hurt to know every pop culture reference and cult classic known to man. I was ridiculed for the longest time when I didn’t understand the Monty Python and Princess Bride references. Which by the way, I finally watched. To be honest, I didn’t understand much of the humour. Probably a generation gap thing though. Reflection. What a great way to start the year. It’s amazing how lives and goals change over the course of a year. Go for your BA. Get out of school and see the world. It’s crazy out there, but worth it. Seriously considering starting a blog about the mediocre player. Leet sites don’t need to hear about my successess, worries or fears. I am sure those that have 10m ICC on farm are not interested in what I have to say. But, I was there! Last night! For the first time (and it was kind of easy). My #1 game goal? Become a more consistent raider and be a valuable asset to the team. And that, is a goal that I am improving on everyday. Your blogs have “value added” to my life. I get something out of it obviously or I wouldn’t return on a regular basis. @Lychordia: I’ve always wondered. Do parents with kids who play WoW ever get the urge to roll a character on the opposite faction for the sole purpose of ganking their kids? Good luck with resolutions, I hope 2010 is a good one for all of you! I’ve seriously thought about Holy Paladin-ing it up for Cataclysm, Matt. If and when the time comes and that vacancy is still there, I’d love to be able to help contribute. .-= Professor Beej´s last blog ..Looking for New Authors to Read =-. Was a good year apart of reading your blog Matt, lots of good work on the blog and it’s growth over the year and years. Wish you good luck in all your pursuits in 2010. .-= Ardent Defender´s last blog ..Merry Christmas from the Horde =-. 1. Are you saying 8000 achievement points pre-Cataclysm for 2010? I presume that would require some PvP just looking at my own list of PvE-related achievements and I don’t recall you speaking much about PvP as a healing priest. 2. What’s your take on the stiff arm applied by WoW.com to those of us who did apply for the position? More specifically, not even sending out generalized form letters thanking us for our time and interest, but letting us know they’ve chosen someone else. I never really thought I’d be the new priest columnist but like The Great One implied, you have to try or else failure is certain. Nevertheless, I would think a website like that could make an easy form letter in 15 minutes and send replies to all the 300 or so applicants in another 15-30 minutes. I presume you were part of the team reviewing those applications, so kudos on going through that effort. I never realized how different the other side of the coin was until I was reviewing resumes for hiring an assistant at work. It can be quite a chore. .-= DFitz´s last blog ..Will questing become obsolete? =-. @DFitz: 1 – Yeah, 8000 achievements pre-catacylsm. I’d have to tackle some PvP stuff in order to do that and definitely finish out Loremaster. I’m not very good with PvP at all. Not horrible, I just lack the uh… discipline and inerest for it. 2 – That’s not my place to comment. It’s essentially a fire and forget process from the application end and it does take time for applicants to fill out the forms, the editors to go over it, and then to get in touch with the chosen people for paperwork and stuff. And no, I have absolutely no say or place in the application process (I did chip in some recommendations). I don’t get to see who applies and such. Nice work on your 2009 resolutions! I love WoM and I’m so happy to see that so many other folks do too! Good luck with your 2010 resolutions. Hope the year is great for you! .-= We Fly Spitfires´s last blog ..Dragon Age: Origins. Done. =-. @Matticus If I liked leveling, I would roll a toon on the opposite faction just to gank my kid on a regular basis. But at this point he is so “uber” in his mind, I don’t think I would ever get the satisfaction. No, wait! Maybe I could pay someone gold to do it. Hum. That is an idea I haven’t thought of!!!! Oh, thanks for the idea! Good luck with the achievements. I’d love to see in future articles how a Holy/Disc priest figures out PvP, as I also fail to have the drive to do it consistently. 8000 achievement points is a lofty goal. I bet you can do it. I’m aiming for 5k on WoW and 20k on XBL this year. I roll a Holy/Prot paladin, though lately I’ve been exclusively prot for queue times, that I’m learning all the ins and outs of. Maybe we can work together in the future, who knows. .-= Metrics´s last blog ..Feels like Home =-.